Ultra-luxury consignment service, Baghunter, is delighted to announce the launch of an exclusive collection of rare bespoke strass artworks depicting some of the most eye-catching handbags in the Hermès and Chanel catalogues. 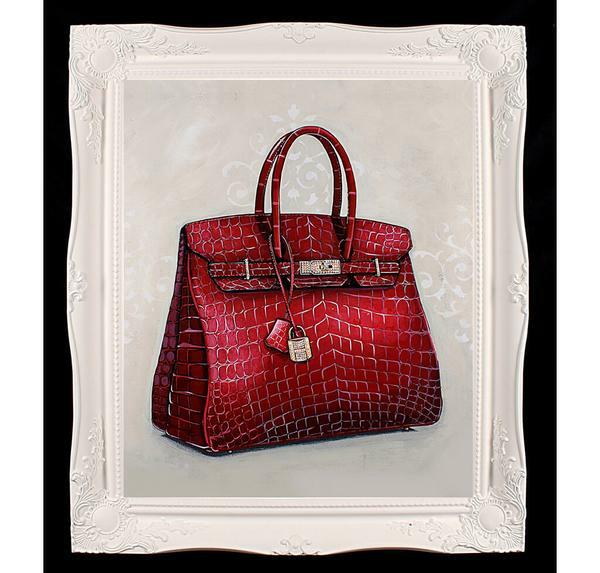 The collection features a select number of original and limited edition Giclée artworks in various sizes, illustrating iconic bags such as the Hermès Birkin Himalayan Crocodile Bag, the Hermès Kelly Black Crocodile Bag, and the Chanel Classic Black Bag among others. The original artworks are created using golden fluid acrylic on canvas and embellished with Swarovski crystals before a finish of high gloss varnish is applied for both protection and enhancement of the depth and intensity of the colors in the painting. The limited edition Giclée art pieces are printed on canvas and also embellished with Swarovski crystals before a finish of Timeless Museum Grade varnish is applied to both preserve and intensify the vivid colors on the print. Both are housed in stunning ornate frames which have been hand decorated and painted in an off-white, Farrow and Ball paint. Baghunter is an A+ rated BBB accredited business which buys, sells, and consigns ultra-luxury handbags and purses including brands such as Hermès and Chanel. Baghunter also offers an authentication service for every bag sold through the website, a Bag Bespoke service for customization of bags with Swarovski crystals or bespoke artwork, a Bag Concierge service to help clients find rare and unique handbags, and a VIP Club which offers benefits to avid purse collectors.